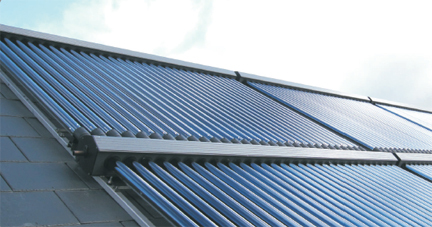 Evacuated Tube Solar Collectors ISE are indispensable in systems designed to manage the central heating or domestic hot water networks all year round, especially in cold weather. 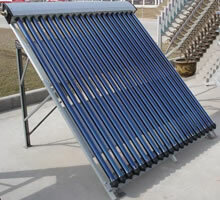 Evacuated Tube Solar Collectors ISE are used for the design of the heating and hot water supply systems. Evacuated Tube Solar Collectors ISE: European quality at an affordable price. Evacuated tube solar collectors ISE may be used together with solid fuel and gas-fired boilers or water heaters. - Evacuated Tube Solar Collectors ISE are a proven design based on the double-wall vessel. Vacuum in the space between the walls functions as insulator. The interior surface of the vessel is covered in layer with high absorption capacity. Inside the vessel there is a copper tube which is used to accumulate thermal energy. With the help of profiled aluminium bands, energy is transferred from the vessel to the copper tube. Heat is accumulated in the head and then transferred to the solar system. - Evacuated Tube Solar Collectors ISE with Heat Pipe tube are made of high-quality copper of high thermal conductivity. - The walls of Evacuated Tube Solar Collectors ISE are made of 3.3 mm borosilicate glass, which resists mechanical damage while maintaining transparency for solar radiation. The head of the Evacuated Tube Solar Collector ISE is made of aluminium with powder coating resistant to atmospheric agents. A thick layer of mineral wool ensures excellent thermal insulation. Evacuated Tube Solar Collectors ISE: reliability is guaranteed by stability and resistance to overheating. Evacuated Tube Solar Collectors ISE are filled with special coolant that prevents any corrosion or deposits and slows down contaminant mass flow rate. In the Evacuated Tube Solar Collector ISE, absorbing coating with high absorption capacity is applied to the interior wall of the vessel, which allows the Collector to absorb up to 95% of solar radiation. In the Evacuated Tube Solar Collector ISE, absorber surface is protected from weathering process by 5×10-2Pa vacuum between the walls of the vessel. Evacuated Tube Solar Collectors ISE: High productivity in the autumn-winter inter-season period. Evacuated Tube Solar Collectors ISE: Heating and hot water in your home!